Enrollment in graduate study led Harold Varmus, A.M. ’62, S.D. ’96, to discover that his initial inclination (medicine) was the right one. 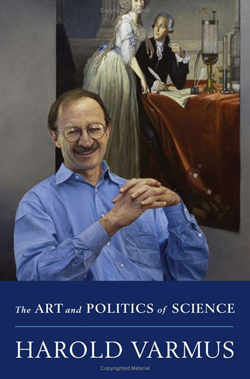 In The Art and Politics of Science (W.W. Norton, $24.95), he traces a career that led to a Nobel Prize with J. Michael Bishop, M.D. ’62, S.D. ’04 (whose memoir was excerpted March-April 2003, page 48), and then to the National Institutes of Health and Memorial Sloan-Kettering Cancer Center. Occasionally on Saturday mornings, I traveled across the Charles River to join some Amherst classmates at Harvard Medical School, while they sat in the Ether Dome at the Massachusetts General Hospital, entranced by diagnostic dilemmas discussed at the weekly clinical pathology conference. These stories struck me as far more interesting than those I was reading, and my medical school friends expressed genuine excitement about their work. They also seemed to have formed a community of scholars, with shared interests in the human body and its diseases and common expectations that they would soon be able to do something about those diseases. I decided to consult the augury again, by reapplying to medical school. Harvard Med had the first deadline.…I was soon granted an interview with the notoriously confrontational dean of admissions, Percy Culver, who quickly made it clear, in a parental tone, that he found me too inconstant and immature in judgment to be admitted.…In contrast, …[t]he Columbia interviewer, an esteemed physician and anthropologist-rheumatologist named David Seegal, asked about the translation of the Anglo-Saxon phrase Ich ne wat. This was easy; it simply means “I don’t know.” Seegal used it to discuss why a physician might admit fallibility to a patient.…By the fall of 1962, I was happily enrolled [there], helped for the first, but not the last, time by someone’s exaggerated appreciation of my competence in two cultures.